WMPLC/REGION V RESA partners with SWMSS to offer Montana Schools with Medicaid Billing Services. 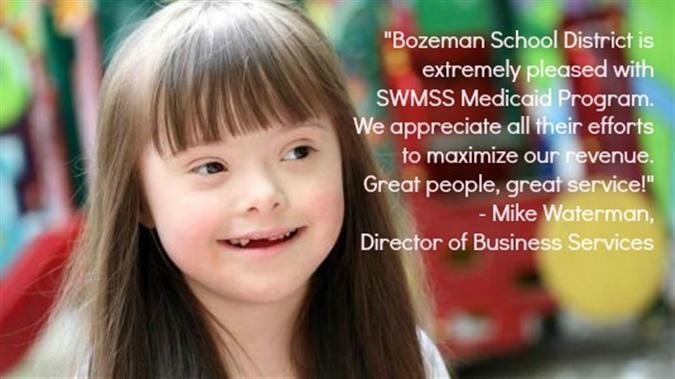 ​SWMSS Medicaid Billing Service is a Montana-based management solution that maximizes third party reimbursement options through Montana Medicaid. Because we are a Montana-based company we are in touch with schools on a day-to-day basis and currently serve 33 school districts. Our software uses a highly effective and thoroughly tested web-based billing system to track Medicaid eligible services. We help to decrease district expenses while increasing revenue using a two-prong approach of documenting and claiming reimbursable services.